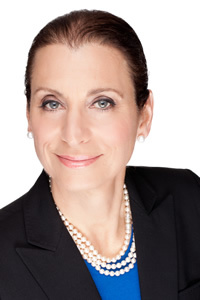 Donna Olshan is the President and sole owner of Olshan Realty Inc. which she started in 1980. The company is known for its high level of service, innovative marketing techniques, relocation department and cutting edge technology. Olshan is the author of the Olshan Luxury Report, published weekly, and frequently quoted in the New York Times, Wall Street Journal, Observer, The Real Deal, Crain’s, Politico, and various media outlets. The report covers all the contracts signed in Manhattan at $4 million and above is considered an industry standard, and the “go to” resource for buyers, sellers, developers, banks, hedge funds, and various institutions looking for a pulse on the Manhattan luxury market. It has a global list of subscribers. Olshan Realty Inc. is a trend setter. It was the first residential brokerage company to have a corporate relocation department. Olshan has represented every major corporate relocation company in addition to a long list of Fortune 500 companies that have included Sony, General Electric, IBM, Citicorp, Mercedes Benz, Credit Suisse, Cartus, Brookfield Global Relocation, Coldwell Banker Relocation, Prudential, Associates Relocation and Royal LePage of Canada. Olshan Realty was the exclusive Manhattan broker representing the group moves of Mobil, Exxon, J.C. Penney, American Home Products, and GTE. "We attracted our following among the corporations because of our service. I am a great believer in follow up and meticulous attention to detail. It is important to listen to what the customer wants. Many brokers can't meet the paperwork and reporting demands of corporations and their executives. Word of mouth and repeat business is very important to us. Some of our clients have been with us for over 20 years," said Olshan. "Over the last three decades, we have been through many kinds of markets and each presents its own challenge. We have a pro-active marketing approach that embraces technology and social media. On the buyer side, we've got the knowledge, skills, research, data, and contacts to be able to direct the customer to the right deal. This is a professional's firm where every agent has a lot of experience and where the owner is always available to personally speak to any buyer or seller working with an agent of the firm. My name is on the door and nobody gets lost." Donna Olshan is a graduate of George Washington University, the wife of Peter Bonventre, a three-time Emmy award winner, best selling author, and former magazine editor and ESPN commentator. She is a member of the Real Estate Board of New York and has served on the Board of City Lights Youth Theatre. She is the founder and board member of the Martin V. Bonventre Lectureship Series at Brooklyn Hospital which features world-renowned doctors speaking on various cutting-edge topics in the medical field.